to contact, donald.toon, varas, sajid.javid.mp, policing.minis., me, omarloum, lotusprincess4u, bae146, rachel.davies, john.humphrys, look.north, lep.newsdesk, ministers, bob.gallacher, graham.farrant, farront, homeaffcom, privateoffice, telegraphedito. UNINSURED CARS used in serious organised crime, police-led Lancashire. Photos in order: police officer Tracey Kennedy leaves my house for one of her many jobs: this day, she told me, it was as manager of Lancaster Homeless Unit. The car R205 XRJ was a stage prop only; she did not drive and was bought this to be seen outside my house as she posed as me and I had my red Toyota Yaris X165 YUB, this was to be proof she was me. She could not drive, so, was this car insured? If not, how did it get to be at my house? Car 2 issue YK02 VPF a car used by a looter of the dead Flat 5 Penhale Gardens LA3 2QA which car was looted from a lady bullied to death in Flat 3 and the looter claimed to be me while I was apparently the daughter of the deceased and had “inherited it” while the looter had a provisional licence IN MY NAME. She drove this with no L plates, and thus no insurance aided by council staff MW54 EVL a blue Ka. PF08 WDJ the Mitsubishi Colt at 32 Fell View I found was apparently driven by me as if the old troll using it was my dead mother which she claimed to be. How could that be insured? I found that after I left Penhale Gardens and moved to Fell View on 24/3/14 to rent 28 Fell View LA2 9RP, added to which she in 32 has 2 names MARY LAMB and MARYLIN REID which she was “given” in 2017 as the FRAUDS were being found out as I’d reported for YEARS. 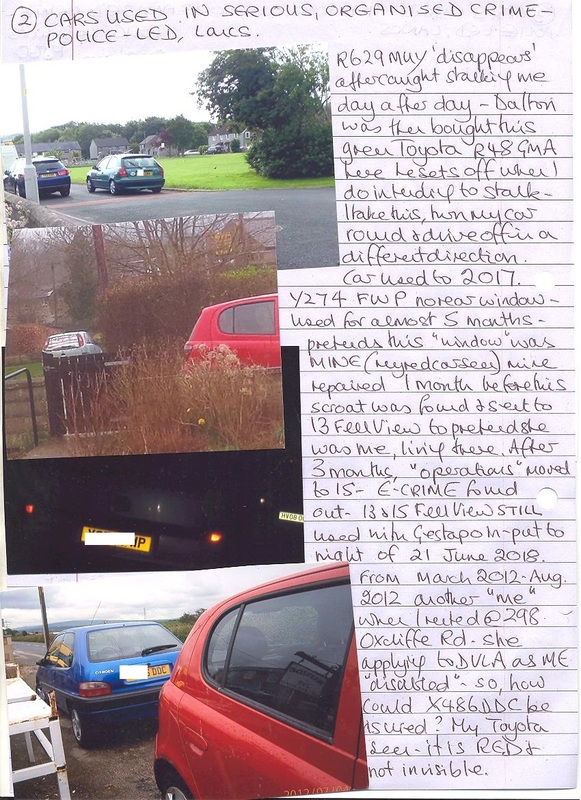 R629 MUY the red Corsa at 45 Fell View, a stalker from the day I moved to 28, I had no idea who the yob was, but took photos and when he saw that, the car “disappeared”. It was later replaced by a green Toyota R48 GMA and here he sets off to stalk me again: I pulled in and took this, turned my car around and drove off in a different direction. He is TRAVIS DALTON and told me end Aug 2016 that he could not remember these cars (well he would say that, wouldn’t he?) adding he had never had a licence. WHO BOUGHT THIS LIFE LONG UNEMPLOYED YOB the cars knowing he had no licence? This car used with Gestapo aiding and abetting in 2017 again. In Dec. 2017 the Gestapo arranging for my car window to be smashed to hope I claimed on my insurance as JUNE FRANCIS WILLIAMS in 30 Fell View also claims to be me and their cars (5) were apparently mine. She was to be seen where I was as “proof” she was me claiming on my insurance. I did not claim; a month after I paid for my repair, the Gestapo arranged for the lowlife unemployed to drive to Fell View and use 13 Fell View (known thieves, fraudsters and E-CRIMINALS, STAIG) and pretend she drove me and was my daughter by watching when I drove off from 28 and stalking. Who paid her to drive to Caton for almost 5 months? How could she, unemployed, fund the petrol? The rear window smashed and covered was ILLEGAL, how did she manage to keep it like that for all that time? I saw her, small, not very old, dark haired with a scroat as passenger but why not claim on her insurance to repair the damage? Because she was not insured. I suggest that the Gestapo pulled her up seeing this window and found they had a use for her. After 3 months of using 13 Fell View, the “operations” moved to 15 as I also apparently live there as well. On 21/6/18 the Gestapo and various lunatics pretended I had just moved into 13 Fell View again. This car “disappeared” when I emailed saying it could not possibly be insured. Y274 FWP. Was X486 DDC insured? 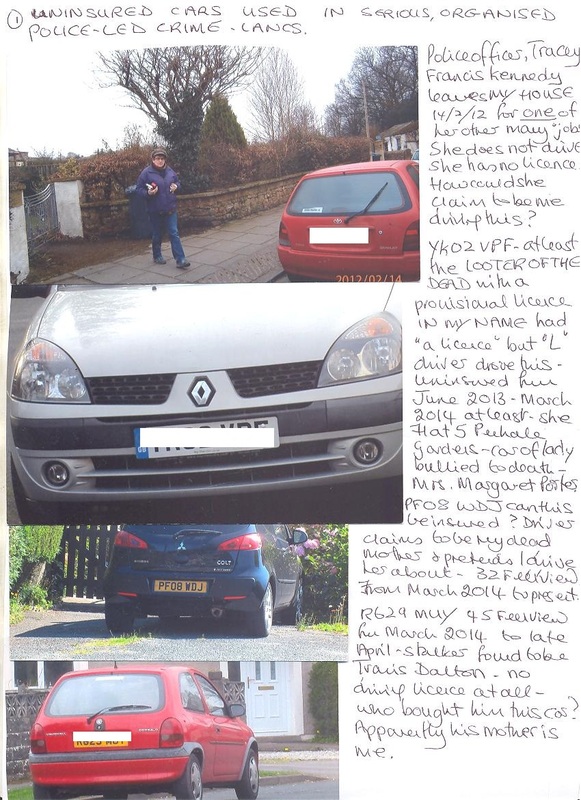 When I rented at 298 Oxcliffe Rd LA3 3EJ from March 2012 to 1/7/13, this car was left there and I found it was supposed to belong to a Diane Lennon who did not live at 298 at all but pretended to in just calling for mail addressed to me when tipped off by the landlady. I found she claimed to be me “disabled” and just applying for a licence. How was this car moved about although infrequently? It could not have been insured. My red Toyota is seen on 2 photos on the page here. It is RED it is not invisible. Also at 298 was PJ60 BYR and this was also supposed to be driven by me for another who pretended to live at 298 but did not. THIS AT SAME TIME AS USE OF X486 DDC. He claimed he was disabled and that I drove him about but this car rarely moved at all; how was it insured for the infrequent drives it had? My red Toyota in this photo. Then also at 30 Fell View. 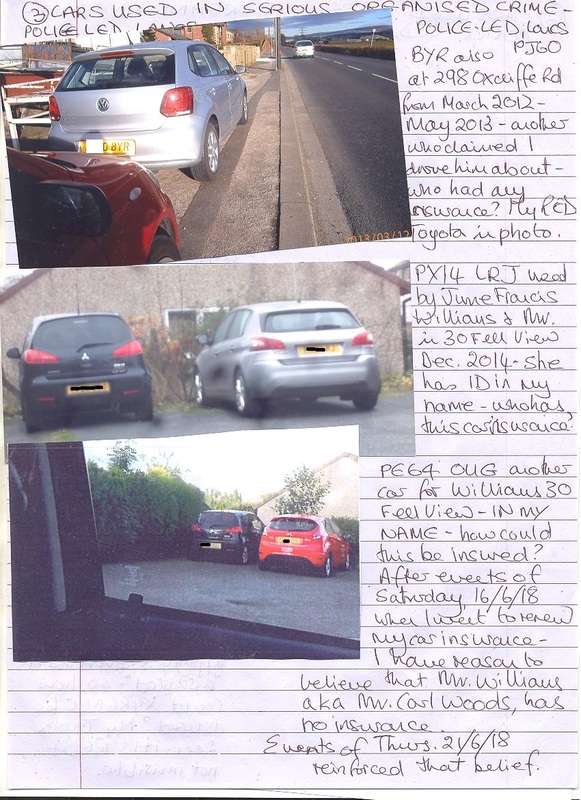 PX14 LRJ Dec 2014 and Mrs J F Williams having ID as if she is me, how is any car she has insured? But in 2015 she had this FORD PE64 OUG as it was red and she needed to be seen in a red car to be ME. How was this insured? She/they had it only a few days as I went to inform the garage named as to what they dealt with; the car “disappeared”. On 16 June 2018 I went to renew my car insurance and found the usual lunacy in harassment but this time, a taxi thug (known stalker) waited and he with a seedy old male was to rush into the insurance office when I did as that was to be MR K WILLIAMS from 30 Fell View aka MR CARL WOODS asking about car insurance and using a taxi as if he did not drive a car at all. Mr Williams drives whatever they have, not often but he does. Hiding in a doorway as “back-up” was another seedy old male, and on 21/6/18 I used a library miles away and found the same type of seedy old male waiting for a bus right where I had parked my car. It was not coincidence: They were all to be MR K WILLIAMS but as his BOGUS MR CARL WOODS who does not seem to drive using buses and taxis. So, is the old fraudster in 30 MR actually insured to drive about? Ends. Carol Woods Ms. This data is illustrated by one photo but ALL events are on camera for any real inquirer. 16/6/18 and 3 days earlier I received my car insurance documents to insure my car Red Toyota Yaris X165 YUB. The Gestapo expected me to dash off the next day and renew the insurance. I have used the same firm for 25 years at least which is odd as apparently I am not me with car and licence of even longer. I did not go the next day: they had ready at least 6 lowlife from Fell View LA2 9RP where I rent 28 (under duress) who were all to be “seen out” thus ME if I went to insure my car. THIS IS DONE EVERY TIME I RECEIVE MY UTILITY BILLS. As I did not go that day, the Gestapo then have ANOTHER few in line for the day after: I still did not go, thus Saturday they had MORE which included a white shirted male of the FRAUDSTER type who claims to have met with me; apparently I have just moved AGAIN. The white van is the police officer ANDREW HALLIDAY white van parked at MY house from May 2008 which was PROOF he had bought my house, apparently: ASK DAVID CARTER OF LANCASTRIAN PROPERTIES FORMERLY CUMBRIAN PROPERTIES, HIS MASONIC MATE. No one can give me Halliday’s rank and badge number. But that is why I have DAILY, year in and out, thugs in white vans sent to park and stalk and PRETEND. With the white van was the usual half-witted unemployed who thought I could not see them waiting to stalk me they in the cars YOU fund. Other cars and one unemployed male from off Fell View, another deluded old parasite who thinks if he stalks me in B6 ROV then he can be said to be linked to me; he is used as Halliday’s van was BV06. The rest are on photos as well with them “hiding” parked along my route to send their texts to the next in line so that the “welcome committee” is at the insurance office. THE ILLEGAL GPS ON MY CAR ALLOWS FOR ALL THIS. The old trout was to then drive off and that was the RED TOYOTA SEEN which was PROOF MINE WAS NOT THERE, it wasn’t, I had parked 2 streets away but then went to park where she had been which suggested to me that I was there. How is X165 to be “confused” with PK18? Why a hairdresser’s? Because at least 3 old thieves and fraudsters from 26, 30 and 32 Fell View ALL claim to be me and use hairdressers as part of claiming that ID. They are all gormless white haired old parasites who gain CARS and MORE in FRAUD posing as me and claiming ALSO to have links to me. That was not all: driving then to Lancaster town centre they had the usual seen rushing to the library as they are to be me apparently if they use the computers when I do. I did not stop in Lancaster so the Gestapo assumed I was going to Sainsbury’s so had ANOTHER “daughter” to be seen there when I was; I wasn’t, I drove past. The woman had the long knitted jacket but grey not fawn as usual: she had the PINK BAG which was to be PROOF somehow she was my daughter when it was nothing like the one a daughter of mine did buy me in 2010. The use of such dubious characters is because they are dubious and ALL are selected from CRIME RECORDS with the Gestapo claiming they are MY daughters thus I am not really me but someone they want to claim is a member of a criminal fraternity/family. Thus they found a VICKY McQUAID in 2013 a total stranger and half the age of my grown children; she a druggie and thief then was swapped for NICHOL McGUIRE of Fell View, another thief and fraudster but oddly also my daughter. Then at least 3 were used in 13 and 15 Fell View, Hunter in 22 and so on, ALL thieves and fraudsters with druggies relegated mostly to 34 Fell View and I live there as well so they visit me apparently. But they the cheap “blondes” (why do blondes dye their hair roots dark?) were replaced with at least 12 TWELVE in events of harassment last week alone as apparently the daughter in question is now blonde and not dark, UNTIL TODAY when she was back to being SHORT HAIRED and fairly dark and tall so, that is now back to JOANNE HALL who has never been to Lancaster but who the Gestapo and GMP thugs are desperate to make into MY daughter. The one used at Sainsbury’s today was nothing like J Hall. J HALL had a misspent youth and has a long record for drug abuse, theft and shoplifting etc, how do I know if she is not from Lancaster area? Because she is my sister’s youngest daughter. Thus I am also my sister apparently. See how my name changes, McQuaid, McGuire, Hall and so on with Williams, Jackson and Lamb aka REID in 30, 26 and 32 Fell View resp who are also ALL ME. I add to this one week after the attempt to have bloated old fools stalk and be seen where I am to try to make it real that Mr K WILLIAMS in 30 Fell View is really linked to me and thus I am his horrendous wife JUNE FRANCIS who is so deranged she thinks she is me and he claims (to aid her) that he is MR CARL WOODS; I have since had a bloated old lecher from 17 Leslie Ave off Fell View, used on and off for at least 2 years, BUT EVERY DAY THIS WEEK, GIBSON who has a “disabled” wife, he with black van B6 ROV stalking me and caught again today and on photos: who funds that unemployed stalker? WHY? This is a DWP fraud to make me disabled, I guarantee. Thus information has gone to DWP Fraud dept. Please see photos, and I add that Lancaster library, serious email problems to day with one male halfwit to wait to see me log off where he then shouts in a bogus phone call that he was meeting someone at the bus station and called them “Chicken” in the farce; that was Gestapo covering for the fraudster and thief, deranged and deluded WILLIAMS in 30 and his THEFT using my rear garden (28 fell View) where he then claims he was “only feeding the chickens” see photos, as I asked “What chickens”. That was why a masonic male was sent to 26 JACKSON and pretend to me to be her brother when I knew she had no brother, all he was sent for was to walk through 26 from front to rear to see if chickens could be seen from anywhere at all. They couldn’t be seen. Jackson is also another to pose as me for gain; she is partner in crime to JUNE FRANCIS WILLIAMS wife of Mr K Williams who is aka Mr Carl Woods. Alice laughed. “There’s no use trying”, she said. “One can’t believe impossible things”. “I daresay you haven’t had much practice”, said the Queen. “When I was your age, I always did it half an hour a day. Why sometimes, I’ve believed as many as six impossible things before breakfast”. Alice’s Adventures in Wonderland. Lewis Carroll. The legal definition of a cover up: This category provides that qualifying disclosures include information not only about the substantive malpractice, but information which tends to show the deliberate concealment of information about the malpractice. Participation Case Law: Procure meaning “to produce by endeavour” Lord Wigery “you procure a thing by setting out to see that it happens and taking the appropriate steps to produce this happening” AG reg No 1 of 1975. Dec 2010 COUNCILLOR GEOFF MARSLAND long standing friend was sent with a message for me: if I FORGOT all about my whistle-blowing and forgot all about MY HOUSE, then “they” MIGHT” leave me alone. Otherwise they would continue to send “signs” that they watched and “put the frighteners on”. I sent him back to tell “them” that there was nothing wrong with my memory. ONE EXAMPLE OF A SIGN (always from deranged and deluded idiots). Issue IPCC and corrupt staff member of YEARS ago NEAL JASPER so HUNTER the loud mouth in 22 was to stand in their rear garden and when I was hanging out washing she was to start shouting Neal Jasper a few times, it was the lunacy of “brainwashing”: I was to hear that unemployed troll and forget that I know all about IPCC corruption with such as Jasper. The “plan” then to “see me off” failed so, one week into June 2018 and the loud mouths in 17 Langdale were to start again when they heard me in my garden, they were to shout to an invisible dog and pretend it was JASPER. Their shouting went on for almost an hour as usual. ALL my reports of harassment naming shouters, bullying halfwits are all ignored yet apparently, I am anti-social when I shout EXCEPT, they cannot say when I shouted nor what I shouted. That is why at least 2 older women with mental health problems are used where I am and they are to shout and be “anti-social” and “witnesses” claim that I was present so it was my shouting! The council and Gestapo use all criminals to be “witnesses” to whatever they manufacture. 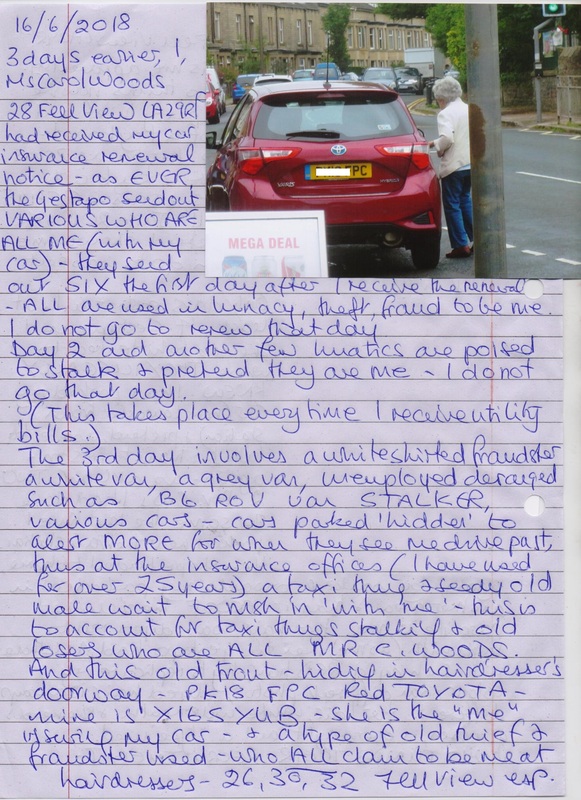 Page 1 of 5 notes: A few photos of evidence of COUNCIL LED HARASSMENT, INTENT TO DEFRAUD, INTENT TO HARM and more. Photo 1: this bin was dumped at the rear of 28 Fell View LA2 9RP ready for when I moved in on 24/3/14. I had been calling to decorate; it had not been there, they left this with lots of rubbish that the bin-men could not take; without my car I’d have been left with it. The thugs used the SLEEPER which is an old act of thuggery as my brother works for Network Rail and I am to forget that and be the person THE COUNCIL INVENTED without my brother and think all I know is a rail sleeper in a bin! 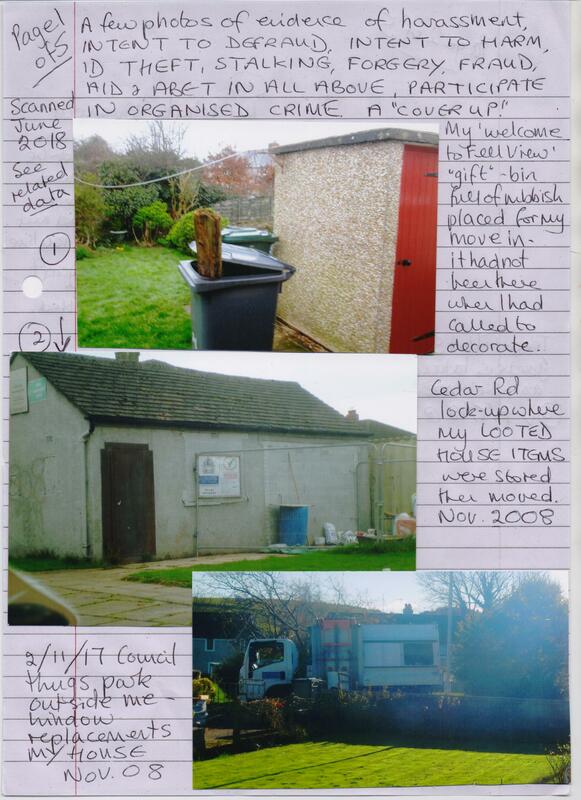 Photo 2: this is the council lock up on Cedar Rd Lancaster where council thugs stored items LOOTED from MY house in Nov 2008. They cannot in all this time produce ANY legal jurisdiction for even being on my property let alone looting it. Photo 3: council thugs think they are clever and amusing and parked outside me in 28 Fell View 2/11/17 with replacement windows to hope I forgot the WRECKING OF MY HOUSE PLUS ITS WINDOWS Oct 2008. Page 2 of 5: Photo 4: MY details given out without my permission so that this would-be fraudster could claim he had met with me and that MY HOUSE was sold via him. He I found stood by my car and that was to be proof he had met with me. This is done almost EVERY SINGLE day with all thugs and fraudsters given MY details and my car so they know who to watch for and stalk to pretend such as 16/6/18 again. Hundreds of photos for any enquirer. Photo 5: the tenant of Flat 5 Penhale Gardens when I rented Flat 3; here she AS ME goes to ANOTHER driving lesson and told to wear hoodies to hide her grey hair and aged flabby face and she really thought she could be said to be me. The PROVISIONAL LICENCE supplied to her IN MY NAME. Photo 6: I had not gone out so as usual, the lunacy is brought to me; 6 10pm on 4/5/18 and council sleazy walks up and down outside me in 28 Fell View and waves papers and pretends I have just moved in again. I ONCE moved on 4/3/12 so they pretend I move EVERY 4th of EVERY month of EVERY year since. Photo 7 is ONE car that the council provided for HUNTER in 22 Fell View as apparently, I lived there being cared for and driven about by them (total strangers) but Mr claimed I was his mother, found out in FRAUD, they decided I was her mother then they decided she was me. This car black VW was used where she would hide edge of Caton then stalk me back to Fell View and pretend as she parked up after I did, that it was PROOF she drove me; KW54 XDO one of at least 3 the tax-payer bought for them. They STILL do this using whatever they have been bought to recent. FE11 OBN is a relative of theirs who routinely pretends he moves in “someone” (me) from somewhere else so they can continue to claim their FREE MONEY. 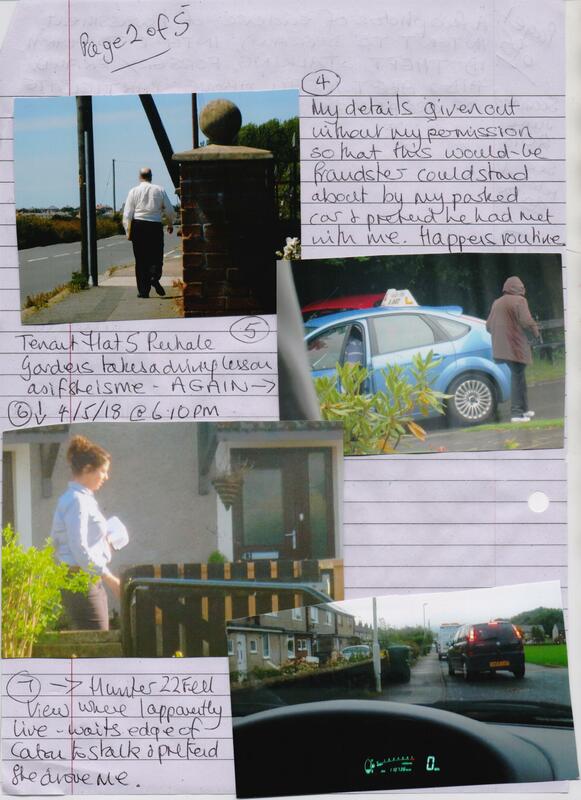 Page 3 of 5 and Photo 8 is a council thug sent to 26 Fell View with the INTENTION ALL ALONG of making AGNES JACKSON into me. He stored pieces of board in 26 and then after I moved to 28 he then arrived to PRETEND he dealt with THE WINDOWS AT MY HOUSE AND THUS THAT OLD THIEF JACKSON WAS ME. 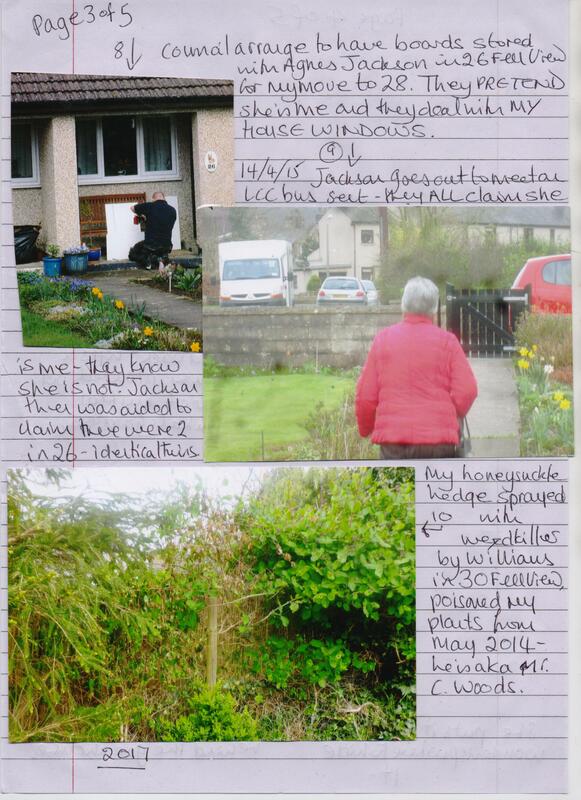 Photo 9: 14/4/15 and LCC council bus for the “infirm” sent at huge cost to hide behind 31 Fell View in their large yard which then drives down to collect JACKSON from 26 who is collected as if she is me. Jackson long term thief and fraudster posing as me “disabled” and “too ill” to take the usual bus as the liar she is the council KNEW EXACTLY what they did. I have many photos of the louts driving these buses to stalk me and PRETEND that they drove me. My car just seen; the red Toyota. Photo 10; my honeysuckle hedge which WILLIAMS in 30 Fell View sprayed with weed killer 2017 in a FRAUD PLANNED with BLENKINSHIP In 34 their garden seen over my hedge. Mr K Williams aka MR CARL WOODS in FRAUD which they had to see into my garden to pretend it was PROOF I was linked to them and their druggie chums using 34 in frauds and E-CRIME etc. 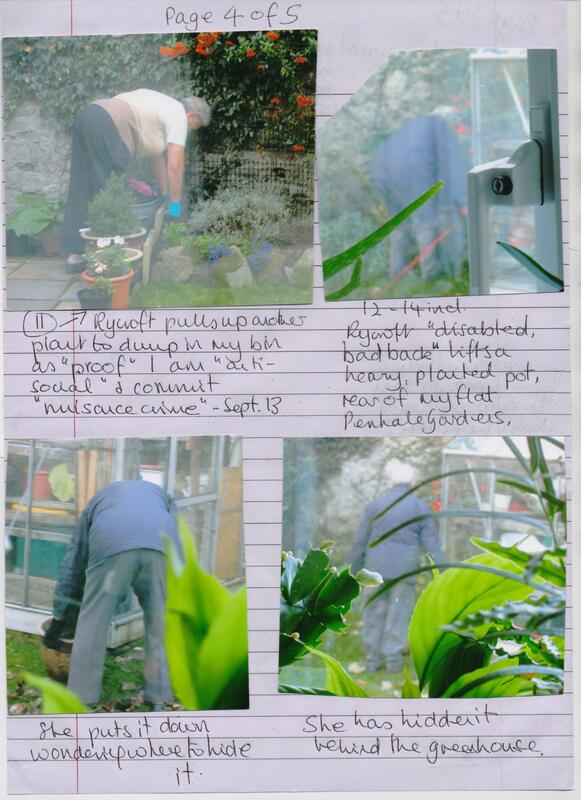 Williams had sprayed all my growing plants which were “coming on” well by May 2014; he is jealous and malicious; reported and ignored as usual. Photo 11 on Page 4 of 5. This is ONE thief and fraudster, malicious bullying liar and worse, SHIRLEY RYCROFT Flat 4 Penhale Gardens LA3 2QA when I rented Flat 3. Rycroft was only 1 used. I kept finding lovely plants in my bin, who could have put them there and why? They had been lovely in the bits of gardens. Early one morning, Sept 2013 I was up for a drink and RYCROFT was ripping up another plant which she then placed in my bin. I took photos more and more. She claimed it was PROOF I was “anti-social” and committed nuisance crime. Photos 12 – 14 incl. Nov 2013 and a great deal of effort into manufacturing as FACT that I committed crime using known thieves and fraudsters and worse as usual. Again early morning and Rycroft lifting a heavy planted pot despite her life-long “bad back” which is why she hadn’t worked and was a parasite. She walks with the pot and I had no idea what she planned at that time of day as if she’d asked, I’d have moved it for her. It was outside my flat: hers was 1st floor with a balcony. The former tenants of Flat had provided those plants and plant pots: Rycroft had not. She rests it down and looks round; she looks for a place to hide the pot and decided behind the far corner of the greenhouse which was covered by older shrubs. And then she reports to the police that “someone” has stolen a plant pot and the person must have had a car as it was heavy and thus she claimed I had done that. Without my photos, I’d have been arrested for that serious crime. She was not charged with wasting police time as they had wasted all the time arranging with the council what to do AGAIN. Events like this were EVERY SINGLE DAY and STILL are using RYCROFT types round Fell View. Photo 15 on Page 5 of 5. My rear garden by 2015; the far corner which just touches slightly on the corner of a garden of 17 Langdale, back of even numbers of Fell View. 24/5/15. Williams I knew was up to no good in and out sneaking about hours before he was always up; it was 2 days before this; he sneaking in and out of the rear of 30; I was in and out and wondering what he was up. Then a man called with a delivery for WOODS which WILLIAMS leapt out to collect saying it was for 30 NOT 28. He denied there had been a delivery when I have it on camera. He was then told to tell me he was only in my garden (which he does to pretend he is linked to me) as he was feeding the chickens. I took this and asked, what chickens? Langdale garden has chickens which can be heard but not seen (actually, I also apparently live with the loud mouthed unemployed in 17 Langdale as well and they also drive me about which photos are on camera), in case Williams wanted to claim I was Jackson in 26, I took the hedging (photo 16) as far as could be seen, not a chicken in sight. FRAUD, FORGERY and more ignored. In 2016 after the matter was to be covered up, a male was sent to pretend to me to be Jackson’s brother when she does not have one (she does have 5 identical twins though apparently to explain how 2 of her can be in 26 at once when none looks remotely like her) and his job was to walk straight through 26 to the rear and check if chickens could be seen. He stayed 5 mins and then never called again. I am drawing up a document showing the lunacy in making up relatives and family for thieves and fraudsters trying to give them my family make-up to aid and abet ID THEFT. Photo 17 and yet more in the attempt to manufacture as FACT that I have a phone where lowlife use their phones hidden in their cars parked outside me by lying across their front seats to make the car seem unoccupied, they hide behind 31 Fell View and use such as 34 and 45 Fell View in E-CRIME and more. On 22/3/18 I caught JARVIS from 41 (they who think they are also Mr and Mrs C Woods) hiding under my front room window late at night using his phone thus pretending that as it was close to me it was my use. He had kicked my plant pots which alerted me to someone close outside. 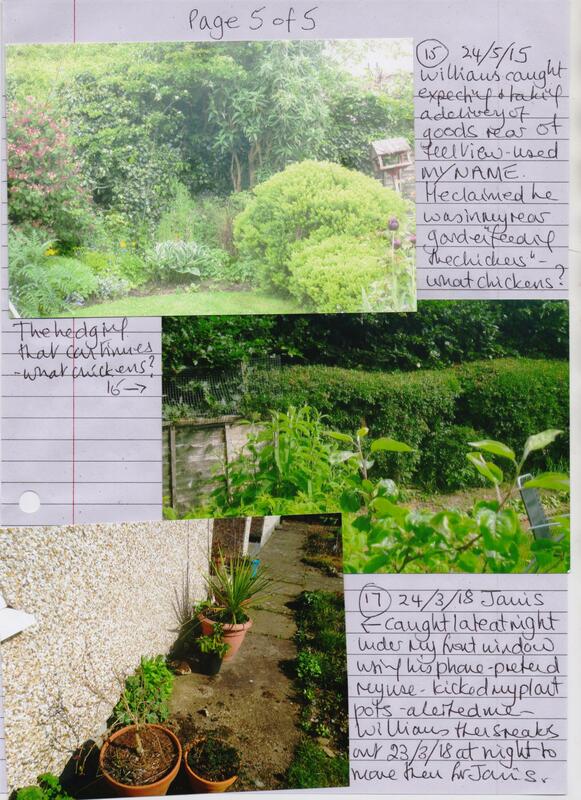 That SEEN Williams was sent on 23rd at night to move my plant pots so that Jarvis could do the same with his phone and not kick pots so I’d not know. I did know but had to wait to 24th to take this to show what WILLIAMS in 30 had tried to do. I have hundreds of photos of such events. 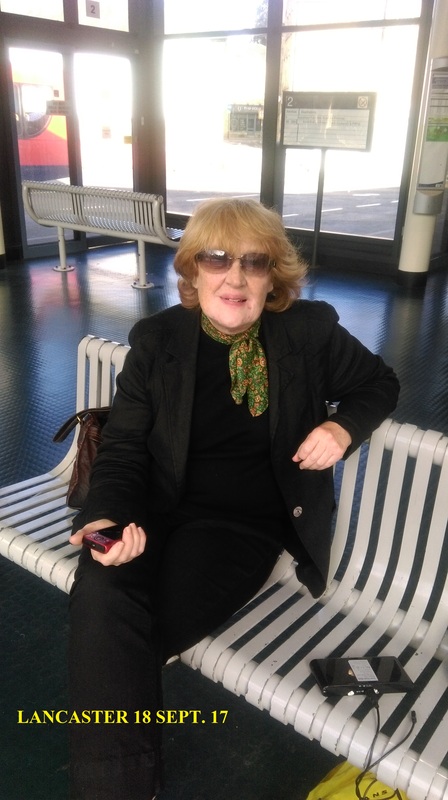 Carol Woods is a former Lancashire County Council Level 3 Social Worker and Child Protection Officer [who used to train social workers] and a former Probation Officer, amongst many other things. Perhaps the appalling and chronic targeting she has no choice but to put up with 24/7 is because she reported numerous seriously grave irregularities she discovered, including child abuse, when being employed by Lancashire county council, and when one realises that the very controllers of the targeting and stalking Carol is forced to endure are, very probably, very closely connected to the same departments and personnel who are described in the links above and the “IMPORTANT VIDEOS” shown below, which detail what was discovered when Carol worked as a Child Protection officer in Lancashire, then it should not be hard to understand these hostilities enacted against her. Put it this way: the Welsh scientist, weapons expert and authority on biological warfare, employed by the British Ministry of Defence David Kelly was supposed to have leaked serious information to the detriment of the PTB at the time – look what happened to him. Now, Carol is no weapons expert, but one doesn’t have to be one to upset the proverbial apple cart bigtime. And anyway, we are told there have been assassination attempts upon her life too – quite a few in fact, including ramming her car at speed, on a main road, by perpetrators unknown…well, almost unknown. These people are the lowest pieces of crap to walk the earth. Members of Gmp also do this twisted gangstalking . Maybe all the forces do it. I hope you get justice. Get a phone that shoots hd videos.u can use the video function without a sim. Just use an sd card. That way the plebs wont get your phones imsi no and so cant use it to fabricate calls. They are losers and are incredibly camera shy,possibly because they look so awful. I film them almost every day + have done on my phone for years, but my mobile was destroyed recently after constant attacks, losing all contacts, messages etc etc – a real drag, but that only lasted until I got a new phone shortly after – now I’m much more careful and use numerous temporary PAYG sim cards in £5 2ndhand old phones . Now I’m a lot wiser. Loads of retards are involved, – the stalkers include old women, homeless people, teenage girls, prostitute-looking women who accost me on the street, or some who just stand and stare at me. All age groups are used too as well as locals and I had 7 or so close neighbours stalking me chroniclly daily a few weeks ago – even strangers knocking on my door in the guise of making out they were looking for the elderly junkie female who lives next door – a regular stalker. I often contemplate what these idiots are told about me. I filmed the characters who knocked at my door – about 6 different times – for reference later before they scuttled off. Others involved in it all inc., i contend, my local plod [who aid and abet that northern force who are guilty of so much], my local council, my GP, the DWP, the hospital i use and many more – even bus drivers have been used in the past [prob. still are] – and yes, they hate being filmed or pics taken – i have a folder with stacks of pics in it ready to go for when the court hearings begin in the future – everything is on memory sticks away from my home and stored safely. Everything is hacked too – I filmed being keylogged also, but the Vimeo a/c that and other stuff was in they closed down, along with DMotion vid a/cs and youtube + OneTrueMedia site + others, but of course i have the originals. They program people too beforehand if, say, i have an appointment to get my eyes tested – yearly, but i can tel by the way these characters wherever act that something is wrong – most just act very weird. I have stacks of audio too of interference during phone calls. But it’s very hard to tell infiltrators from genuine citizens a lot of the time – another problem to it all. And what I am forced to experience is nothing compared to that which Carol has to go through – for 16 years now. See my post on when i visited CW last September – “The Visit” – these retards were on the coach on the 8 hour trip up, and on the return journey also – many of them – by the time i hit home there were 3 sitting around me on the coach, 2 alongside me and 1 in the seat directly behind – insane. I filmed a courier delivery person today too, who called months ago delivering a parcel – he disappeared for months but has returned just to be seen by me – twice recently – all very much filmed. They use anyone they think can be got at – it all must cost a small fortune over the months – see my post about my local postman too “Stalking that Fails” – insane =- and now they act as if nothing happened, but unfortunately for them my memory is excellent. Absolutely nothing here has not been compromised – even throwing stones up at my 1st floor window at 3 or 4am in the night – that went on for months too – i just got used to ignoring it as i do 99% – but i still film etc daily, because i know they’ll disappear if i do that, usually. You can see the worry in their faces when i stand there openly filming them on my phone,- it’s great! I know they’ve been promised that they will always be safe from the long arm of harassment laws, and not to worry if they see me talking pics or filming them but i know inside they think “well if these characters who are supposed to be police can act so oddly and can stoop so low as to stalk someone like this, are they going to be as honest as they make out they gonna be with me about me never having to account and answer for my stalking actions for them?”. I can see the doubt in their eyes about that part when they walk, trying to get away, and, of course, they’re 100% right, as who can trust a bent cop? They can’t even trust each other or themselves, lol….